eBook PDF (820 pages), ePub, Kindle, etc. 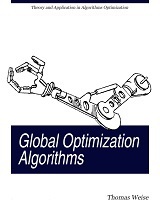 This book is devoted to global optimization algorithms, which are methods to find optimal solutions for given problems. It especially focuses on Evolutionary Computation by dis- cussing evolutionary algorithms, genetic algorithms, Genetic Programming, Learning Classi- fier Systems, Evolution Strategy, Differential Evolution, Particle Swarm Optimization, and Ant Colony Optimization. It also elaborates on other metaheuristics like Simulated An- nealing, Extremal Optimization, Tabu Search, and Random Optimization. The book is no book in the conventional sense: Because of frequent updates and changes, it is not really intended for sequential reading but more as some sort of material collection, encyclopedia, or reference work where you can look up stuff, find the correct context, and are provided with fundamentals..
Thomas Weis is a computer scientist at the Nature Inspired Computation and Applications Laboratory (NICAL) of the University of Science and Technology of China.